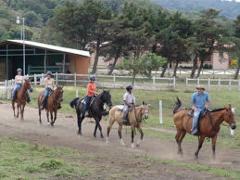 The rides are held in privately owned farms with well defined paths, is the ideal place to enjoy rural life in Costa Rica. Visitors will have the privilege of exploring this beautiful private reserve riding on horse, where you will see breathtaking views of the Gulf of Nicoya and the Pacific islands; Also you got to see little coffee and sugar Cain Plantation, the primary and secondary tropical forests, Galloping in open fields and the wide variety of local wildlife including toucans, green parrots, bell birds and a big Ficus Tree with more then 3 hundred years old. In the early morning hours is ideal to bird watching, horseback riding on this tour not need any experience also the guides speak basic English. Daily Tours at 8:00, 13:00 and 15:30. 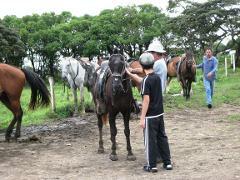 Includes: Round trip transportation from your hotel, Western Saddles, an Costa Rican (Spanish speaking) guide.. Duration: Approx two hours after you departure time. We provide riding helmets and rain ponchos.